The Question Bank is where all the questions created under your account are held. It is possible to create one or more courses or tests without ever creating a single question bank, but this would not be taking true advantage of the benefits of online testing and is not recommended. Question banks can be thought of as virtual containers for valid, accepted questions and allow test maker efficiencies and reporting capabilities unavailable with other assessment tools. Before uploading to the bank, ensure that questions are clearly stated, checked for technical accuracy and applicability to the desired outcome, and edited for spelling and grammar. Principles of good assessment include validity, reliability, flexibility and fairness. As every assessment has different purposes, multiple test generating methods are necessary. All types of structured and unstructured questions may be used, from multiple choice and fill-in-the-blanks to short answer and essay questions. Computerized testing permits more creative interactive possibilities than old paper-and-pencil methods, such as point-and-click questions where a test taker must select the correct part of an image on the screen. Test authors can create, store and manage one or many question banks. These banks can be organized into various folders according to any classification desired, such as subject, objective, level of difficulty, grade or question type. 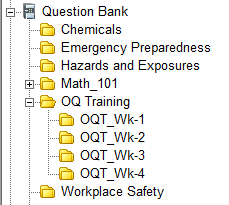 Items may be added to question bank folders by manually typing in questions and answers or by importing from external text or spreadsheet files. By compiling an extensive list of well considered questions, it becomes easy to build a variety of tests to suit many different purposes. Test Generator's Test Wizard allows you to generate unique tests in minutes by randomly selecting questions from one or more question banks.